SACDs - items 25 to 50 Shop MyMusicFix!! Super Audio is a new way of putting music on CDs, resulting in high-resolution and superior fidelity sound. All and all, it is a very high resolution digital mastering of the stereo (2-channel) analog master tapes. You need an SACD-compatible player to hear the difference between a regular CD and a Super Audio CD, but a standard CD player will play SACDs. 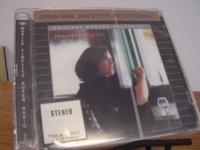 "Patricia Barber, Modern Cool - Factory Sealed MFSL SACD"
"Patricia Barber, Nightclub - Factory Sealed MFSL SACD - CURRENTLY SOLD OUT"
MFSL Super Audio CD PATRICIA BARBER - NIGHTCLUB - SACD - Super Audio CD is re-mastered by Mobile Fidelity featuring new liner notes by Bill Dahl. The greatest advancement since the introduction of stereo, Super Audio CDs employ the innovative single-bit encoding system, Direct Stream Digital. Every SACD player performs superbly with Compact Discs. And Hybrid SACDs will play back beautifully on CD players. The piano-playing singer Patricia Barber has quite a pearl of 12 standards on NIGHTCLUB with three stellar trios, including three tracks with Charlie Hunter's eight-string guitar. The incomparable bassist Marc Johnson also adds supple support on a few tunes and has a very tasty solo on "Yesterdays." And speaking of soloing, because Barber's vocal phrasing, rhythm, and timbre are so unique, it's easy to overlook her brilliant improvisations on piano. Despite their surface similarities, Barber seems worlds apart from Diana Krall in her presentation. Putting out an album of standards after the ultrahip Modern Cool challenges Barber with a different concept, rather than an attempt to capitalize on the tremendous success of other mainstream jazz vocalists (Krall included). In fact, if there's a problem here, it's that the sardonic wit displayed on Barber's previous releases is missing. On the other hand, it's mightily refreshing to report that a great American jazz singer who established herself on her own material has succeeded at an album of standard tunes. It's a chain of events that most vocalists can't claim. On Nightclub, Barber creates a dark, smoky atmosphere where, like any good impressionistic artist, she brings listeners into her world and lets them enjoy art from her side of the creative pane. Quite an accomplishment. Being the daughter of Glenn Miller Orchestra-veteran-saxophonist Floyd "Shim" Barber, it's safe to say Patricia Barber was born with jazz in her blood. The sultry vocalist/pianist has released only six albums during a 20-year career, yet those albums chart an ever-growing critical and commercial acclaim. Barber's 1994 release Cafe Blue led to her winning the "Female Vocalist/Talent Deserving Wider Recognition" category in the 1995 Down Beat International Critics Poll. Her '98 album Modern Cool, like its successor, Companion, charted in the Billboard Top Ten. "Santa Claus Is Coming To Town," like Barber's latest album Nightclub, features the acclaimed rhythm section of bassist Marc Johnson and drummer Adam Nussbaum. 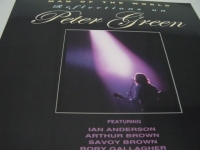 "Peter Green Tribute, Man Of The World"
MFSL Super Audio CD. Artists and Tracks Include: Billy Sheehan "Oh Well" - Rory Gallagher "Showbiz Blues" - Arthur Brown "The Green Manalishi" - Snowy White "Looking For Somebody" - Lonesome Dave Perverett "Love That Burns- Vince Converse "Rattlesnake Shake" - Harvey Mandel "Ramblin' Pony" - Lonesome Dave Peverett "If You Be My Baby" - Southside Johnny "Baby When The Sun Goes Down" - Larry McCray "Black Magic Woman" - Savoy Brown "Stop Messin'" - Paul Jones "Albatross" - Rory Gallagher "Leaving Town Blues" - Ian Anderson "Man Of The World"
"Peter Green, Man of the World Reflections"
"Sonny Rollins, Plus 4 (Clifford Brown, Max Roach, Richie Powell, George Morrow)- CURRENTLY OUT OF STOCK"
MFSL Super Audio CD. 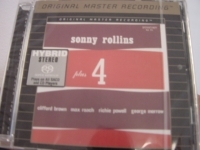 This band was better known as the Clifford Brown/Max Roach quintet, a magnificent unit that had grown even stronger when Sonny Rollins assumed the tenor chair a few months prior to these recordings. 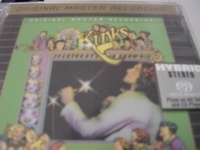 Tracks Include: "Valse Hot" "Kiss and Run" "Count Your Blessings" "I Feel A Song Coming On" "Pent-Up House"
"The Byrds, Mr. Tambourine Man SACD - Factory Sealed MFSL SACD"
"The Byrds, Notorious Brothers - Factory Sealed MFSL SACD"
"The Kinks, Everybody's In Show-Biz - Factory Sealed MFSL SACD"
"The Kinks, The Low Budget"
"The Rolling Stones, Aftermath (US Version)"
"The Rolling Stones, Beggar's Banquet"
"The Rolling Stones, Between The Buttons (UK Version)"
"The Rolling Stones, Big Hits SACD"
Super Audio CD is re-mastered by ABKCO featuring ORIGINAL LINER NOTES . The greatest advancement since the introduction of stereo, Super Audio CDs employ the innovative single-bit encoding system, Direct Stream Digital. Every SACD performs superbly with Compact Disc Players as well as the New SACD Players. Remember Hybrid SACDs will play back beautifully on all CD players. Big Hits (High Tide & Green Grass) Track listing 1. Satisfaction, (I Can't Get No) 2. Last Time, The 3. As Tears Go By 4. Time Is On My Side 5. It's All Over Now 6. Tell Me 7. 19th Nervous Breakdown 8. Heart Of Stone 9. Get Off My Cloud 10. Not Fade Away 11. Good Times, Bad Times 12. 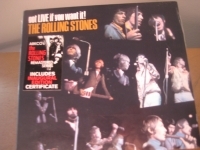 Play With Fire Details Distributor: Universal Distribution Recording type: Studio Recording mode: Stereo SPAR Code: n/a Album notes The Rolling Stones: Keith Richards (vocals, guitar); Mick Jagger (vocals); Brian Jones (guitar); Bill Wyman (bass); Charlie Watts (drums). Recorded in London, England, Chicago, Illinois & Hollywood, California between 1963 & 1966. Like its 1969 second volume THROUGH THE PAST DARKLY, BIG HITS (HIGH TIDE & GREEN GRASS) is a fine collection of '60s Stones classics, but it's a rather bluesier one. This is exemplified by such rootsy tracks as the redefined Buddy Holly tune "Not Fade Away" and the R&B bounce of Bobby Womack's "It's All Over Now." 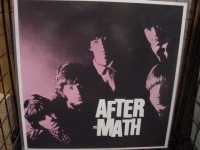 Not that the group's original songs were lacking in grit or attitude; the vituperative "Get Off My Cloud," delivered in Mick Jagger's best Sidcup dialect still sounds magnificent, as does Brian Jones's booming Vox pearl guitar on "The Last Time" and Keith Richards's opening chords to the aforementioned "Not Fade Away." This is a disc to be handed down to your children. "The Rolling Stones, December's Children SACD"
Super Audio CD - Hybrid Audiophile Sound - Digipak Packaging is re-mastered by ABKCO featuring ORIGINAL LINER NOTES . The greatest advancement since the introduction of stereo, Super Audio CDs employ the innovative single-bit encoding system, Direct Stream Digital. Every SACD performs superbly with Compact Disc Players as well as the New SACD Players. Remember Hybrid SACDs will play back beautifully on all CD players Track listing 1. She Said Yeah 2. Talkin' About You 3. You Better Move On 4. Look What You've Done 5. Singer Not The Song, The 6. Route 66 7. Get Off Of My Cloud 8. I'm Free 9. As Tears Go By 10. Gotta Get Away 11. Blue Turns To Grey 12. I'm Moving On Details Producer: Andrew Loog Oldham Distributor: Universal Distribution Recording type: Studio Recording mode: Stereo SPAR Code: n/a Album notes The Rolling Stones: Mick Jagger (vocals, harmonica); Brian Jones (guitar, harmonica, keyboards); Keith Richards (guitar); Bill Wyman (bass); Charlie Watts (drums, percussion). Additional personnel: Jack Nitzsche (keyboards, percussion); Ian Stewart (keyboards, marimba, percussion); J.W. Alexander (percussion). Recorded in Hollywood, California, Chicago, Illinois and London, England. 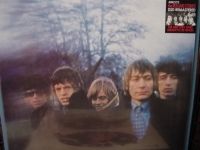 DECEMBER'S CHILDREN marked a crucial point in the Stones' development. The band was beginning to move away from its blues/R&B roots toward something more uniquely its own. Certainly those roots were far from absent in the songs composed for this album, and the Stones still cover their share of the masters here (Chuck Berry, Arthur Alexander, Hank Snow), but something new was afoot. The aching ballad "As Tears Go By," complete with baroque orchestration, heralded a new direction in the Stones' songwriting. Similarly, the folk-rockish strains of "The Singer Not The Song" hint at previously uncharted directions. 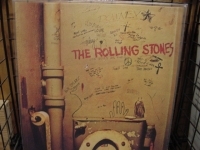 Perhaps the most crucial track here is "Get Off My Cloud, which, while it incorporates the band's rootsy influences, is possessed of a decidedly modern power that the Stones were only beginning to learn to harness. This was the beginning of a style more specific than pop, blues, or rock & roll. DECEMBER'S CHILDREN may be seen as the beginning of what can only be defined as Rolling Stones music. 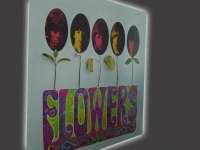 "The Rolling Stones, Flowers - CURRENTLY SOLD OUT"
"The ROLLING STONES, HIT MAKERS - RARE INAUGURAL SEALED SACD"
"The Rolling Stones, Let It Bleed SACD"
"The Rolling Stones, More Hot Rocks - 2 CD Set"
"The Rolling Stones, Out of Our Heads - First Edition U.K. 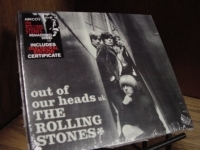 Version"
"The Rolling Stones, Out of Our Heads U.S. 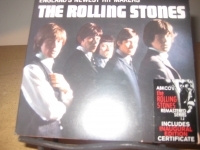 Version SACD"
"The Rolling Stones, Singles Collection: The London Years SACD - 3 CDs"
Singles Collection: The London Years - Factory Sealed Super Audio CD - Hybrid Audiophile Sound - COLLECTORS Digipak Packaging is re-mastered by ABKCO featuring ORIGINAL LINER NOTES . The greatest advancement since the introduction of stereo, Super Audio CDs employ the innovative single-bit encoding system, Direct Stream Digital. Every SACD performs superbly with Compact Disc Players as well as the New SACD Players. Remember Hybrid SACDs will play back beautifully on all CD players. Track listing DISC 1: 1. Come On 2. I Want To Be Loved 3. I Wanna Be Your Man 4. Stoned 5. Not Fade Away 6. Little By Little 7. It's All Over Now 8. Good Times, Bad Times 9. Tell Me 10. I Just Want To Make Love To You 11. Time Is On My Side 12. Congratulations 13. Little Red Rooster 14. Off The Hook 15. Heart Of Stone 16. What A Shame 17. Last Time, The 18. Play With Fire 19. Satisfaction, (I Can't Get No) 20. Under Assistant West Coast Promotion Man, The 21. Spider And The Fly, The 22. Get Off Of My Cloud 23. I'm Free 24. Singer Not The Song, The 25. As Tears Go By DISC 2: 1. Gotta Get Away 2. 19th Nervous Breakdown 3. Sad Day 4. Paint It Black 5. Stupid Girl 6. Long Long While 7. Mother's Little Helper 8. Lady Jane 9. Have You Seen Your Mother, Baby, Standing In The Shadow? 10. Who's Driving Your Plane? 11. Let's Spend The Night Together 12. Ruby Tuesday 13. We Love You 14. Dandelion 15. She's A Rainbow 16. 2000 Light Years From Home 17. In Another Land 18. Lantern, The 19. Jumpin' Jack Flash 20. Child Of The Moon - (Remake) DISC 3: 1. Street Fighting Man 2. No Expectations 3. Surprise, Surprise 4. Honky Tonk Women 5. You Can't Always Get What You Want 6. Memo From Turner 7. Brown Sugar 8. Wild Horses 9. I Don't Know Why Aka Don't Know Why I Love You 10. Try A Little Harder 11. Out Of Time 12. Jiving Sister Fanny 13. 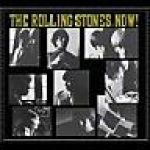 Sympathy For The Devil Details Contributing artists: Al Kooper, Gene Pitney, John Lennon, Paul McCartney, Phil Spector, Ry Cooder Distributor: Universal Distribution Recording type: Studio Recording mode: Mixed SPAR Code: n/a Album notes The Rolling Stones: Mick Jagger (vocals, harmonica, percussion); Keith Richards (vocals, guitar, keyboards); Bill Wyman (vocals, bass); Brian Jones (guitar, harmonica, organ, marimba, sitar, dulcimer, recorder, bells, saxophone, harpsichord, Mellotron, background vocals); Mick Taylor, Ron Wood (guitar); Charlie Watts (drums, percussion). Additional personnel includes: Joe Moretti (guitar); Ian Stewart (piano, organ); Reg Guest (piano); Nicky Hopkins, Jack Nitzsche (keyboards); Eric Ford (bass); Jimmy Miller (drums); Rocky Dijon (percussion); The London Bach Choir, Madelaine Bell, John Lennon, Paul McCartney, Nanette Newman (background vocals); Gene Pitney, Phil Spector, Steve Marriott, Doris Troy, Al Kooper, Ry Cooder, Andy White. 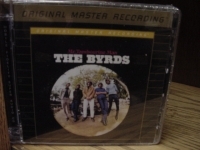 Producers: Andrew Oldham, Eric Easton, The Rolling Stones, Jimmy Miller, Jack Nitzsche. Engineers include: Roger Savage, Ron Malo, Dave Hassinger. 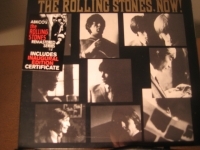 THE SINGLES COLLECTION: THE LONDON YEARS comes as advertised--the box includes every American and British A-side and B-side the Rolling Stones released between 1963 and 1971 (after which the band began releasing discs under the Rolling Stones Records imprint). The fantastic speed and scope of the Stones' early artistic development have few parallels in popular music, and this collection not only details that incredible process, but serves as a microcosm of '60s pop culture as well. From the down-and-dirty Chicago-style blues and R&B of the group's early covers (Chuck Berry's "Come On," Willie Dixon's "I Just Wanna Make Love to You") to the dreamy chamber pop of "Lady Jane" and the proto-hard rock of "Street Fightin' Man," the band was always on the cutting edge, both reacting to and anticipating cultural and musical trends. One listen to this box, however, reveals that, unlike the Beatles, the Stones seldom veered far from their roots, always injecting a vital dose of raw sexuality and pure rock & roll spirit into even the boldest of experiments. 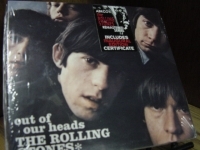 This box set is a compilation of all the Rolling Stones' singles from 1963 to 1971, including A-sides, B-sides and alternate B-sides from the U.S. and the U.K. These 58 songs on 3 discs have been digitally remastered with most tracks in mono to reflect the sound of the original 45s. It includes a 78-page, 12" x 12" book with lyrics, detailed track annotations by Bruce Eder and essays by Anthony De Curtis and Andrew Oldham.